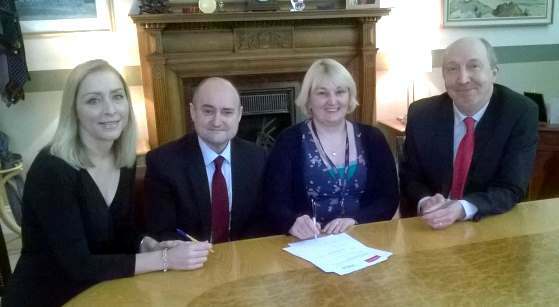 Branch Secretary Amanda Kerr, Ricky Henderson, Council Health and Social Care convener, Kirsten Hey, Health and Social Care steward, and Council leader Andrew Burns sign the charter pledge. UNISON’s Ethical Care Charter aims to establish a minimum baseline for the safety, quality and dignity of care by ensuring employment conditions which a) do not routinely shortchange clients and b) ensure the recruitment and retention of a more stable workforce through more sustainable pay, conditions and training levels. The Charter lays out three stages in the programme. The immediate principles are that services should match need, home carers will be given adequate time to meet that need, home care workers should be paid for travel and given enough time to get from one service user to the other. They should also get sick pay if they are off. Stage 2 of the charter calls for continuity of staff for service users, no zero-hour contracts, systems to support staff raising issues about service users’ needs and regular training. Much of this has already been achieved in Edinburgh for council employed staff but the Charter seeks to extend this to all staff employed in the sector.